Firstly I don't practice swordsmanship ( Fencing ) but I know at least for sure that Hollywood swordsmanship has little in common with real fighting. The above is just to put in contexts my speculations and the fact that my knowledge of sword and shield combat in the usual righthander against righthander is limited. So, here are my question(s) / speculation(s) about how different an encounter between a lefthanded and a righthanded would be with sword and shield or sword and bucker from the usual situation ? The first thing is that instead of sword versus opposing shield you have sword against sword and shield against shield: How would this affect the protective use of the shield and aggressive use of the sword ? What techniques would stay the same and which would be different. In the discussion of lefthander against righthander the point that the lefthander will have experience dealing with righthanders while the righthander may be at a serious disadvantage not knowing how to deal with necessary modification of techniques is a real and important factor, but lets say that both know what would work best I just wonder how such a fight would look like ??? The historical stigma of lefthandedness would mean that a lot of natural lefthanders would have learned how to fight as righties so I assume that a good warrior would become ambidextrous out of necessary. Also formation fighting would mean having to fight as a righty. A lefty might spring a nasty surprise on an opponent by reversing back to his strong side use of his sword. I don't have sufficient knowledge to even ask the best questions about this but I hope that those that do have the practical knowledge will make what I hope will be an interesting and enlightening discussion. Jean, I know nothing of sword and shield, but my two semesters of sport fencing told me that your most dangerous competition was a lefty. There foil was never were it was SUPPOSED to be. Strange thing, the hardest fencer for a lefty was another lefty, they had almost totaly competed against correct.....er I mean right handers that when a lefty fought with another lefty they were BOTH mixed up. Here's a link to another thread which is loosely related - left-handed jousting. I have done a lot of sword & shield work - some was SCA-type combat (25%), some was free-sparring (15%), and some was choreographed (60%). I "ran into" left-handers upon occasion in all 3. IF the left-hander possessed any skill at all, they typically made for a more difficult opponent than a right-hander of the same skill level. I've found Dave's assessment generally true. During my competitve fencing career one of my long-time instructors happened to be left handed. There were many times in competition where that served me well. Lefty against lefty is an interesting thing to see. IMHO as a right-handed fighter I would be inclined to move in very fast right sloping steps (ie. counter-clockwise) around the left-hander's outside to 1) keep away from their shield, 2) close in and bind up their sword arm with my shield, 3) attack from behind with my short edge to their head, neck ,shoulder, back, torso, hip, back of thigh, or back of knee, or long edge to the calf, lower leg. or ankle, maintaining pressure with the shield the whole time. Should they disengage I would continue circling right so that any strike they could manage would be back-handed and easily deflected with my shield while presenting me with a number of open long-edge targets along their outside. I think such manuvering would negate most blade contact while employing the shield in exactly the way it is intended to be, as a dynamic defensive barrier. I think the trick is to maintain superior speed and not be thrown off by the idea of fighting a left-hander, just get in quick, tie them up, and cut them down. Again this is strictly IMHO. I would think that if your suggestions are good your lefthanded opponent would have the same options available to use against you and would be very practiced doing it against righthander and might have figured out counter moves. Lefthander against Lefhander should be the exact mirror image of " normal " fencing in principal: That is discounting the fact that both may be confused if they have never trained against another lefthander. Oh, a lefthander trained to deal with other lefthanders should have an enormous advantage against another one facing this problem for the first time. Another approach is for the LH to still use his shield and sword as a RH: With a two hand fighting system i.e. sword and shield both hands are important to fighting skill: why should the dominant hand be reserved for the sword? I can make a case that a left hander using his stronger side for the shield would have a strength and dexterity advantage as a shield would be typically heavier than a sword. Being or becoming ambidextrous would seem to me very advantageous for any swordsman but ever more so for the LH. You're right, it is an exact mirror image, but I didn't feel the need to state the obvious. The difficulty for the lefty lies in the fact that they rarely fence against other left-handers, so it's just as difficult for them. "That shield can be used to bash, trip, hack, bind... it's a real nuissance when it's actively deployed rather than passively placed in the way. " Absolutely right Aaron. That's precisely what I meant when I referred to the shield as a "dynamic" barrier. In other words defensive in an active, even counter-offensive capacity. In the case of right-handed vs. left-handed fighters as a means of pressing or stifling the left-hander's sword arm to prevent them striking effectively while opening up their outside targets. With aggressive use of the shield as a weapon the LH vs RH is a shield against shield situation and less a shield against sword: There might be a lot of lateral and circular manoeuvring by both to try to get at the sword side. A heavy weight fighter might use his shield to pound the other into the ground. Subtle feints and tactics must exist for a skilled LH to use ? 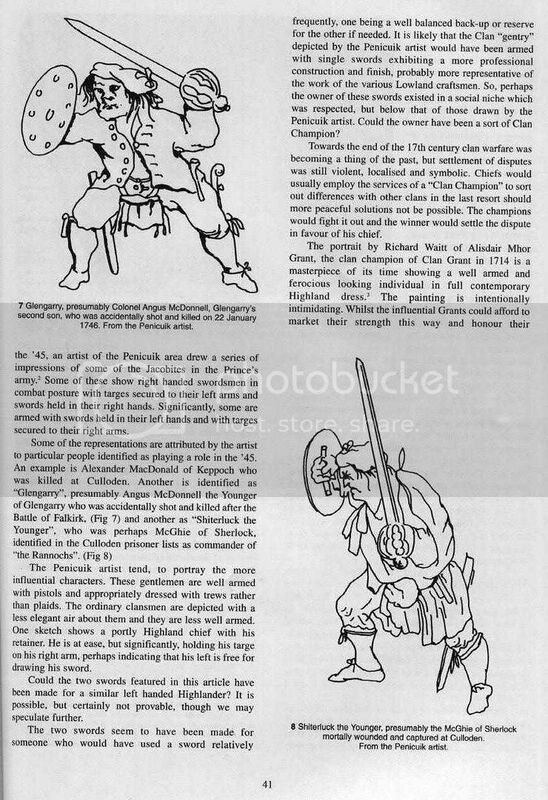 To get away a bit from a symmetrical sword and shield against the same, a LH armed with a pole arm or great sword ( Or even bigger twohander. ) Could attack and defend from opposite angles to a RH combatant. 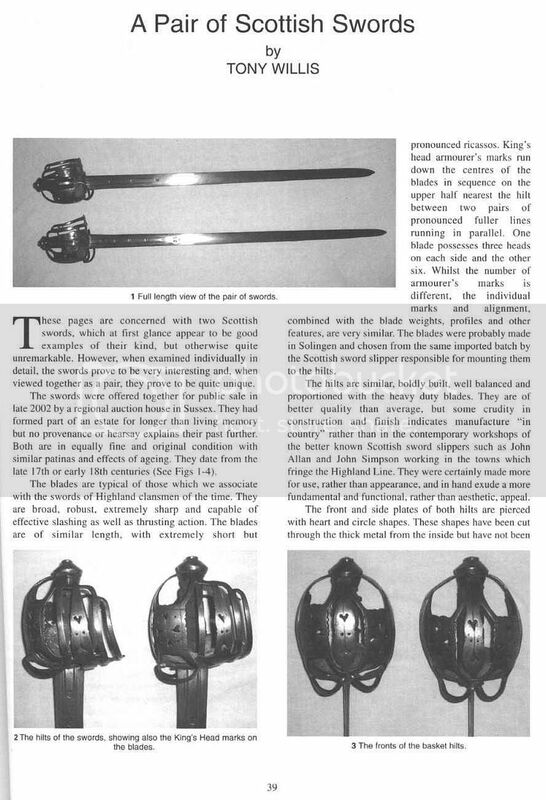 With these I can imagine a very ambidrextrous style of longsword fencing were the lead hand and LH / RH tactics might be in constant flux. A true ambidextrous style maybe ? As a lefty myself I'm constantly doing this sort of weird stuff like I will use my computer mouse with my right hand while I use the keyboard with my left at the same time: I find this effective when playing keyboard and mouse computer games like age of empire II. Oh, on paper or with a drawing pallet I will use my left hand, but I draw ( Photoshop ) with my right hand with the mouse. A bit far from swords there but my point is that the average LH is much more capable with his / her right hand that the average RH is with his left hand. As a whimsical fantasy I wonder what level of terror / confusion if an entire formation of spear / shield / sword formation switched to LH use of their arms in front of their opponents' formation factoring in the superstitions of the Medieval mind ! Firstly, unlike RH vs RH there is no historical evidence for LH vs RH shield OR buckler use. Secondly, do people here know how shields and bucklers were used RH to RH? Whatever was done LH to RH was sure to be based on the same principles as RH to RH, so a discussion of shield and buckler use will be pretty sterile if half the people are basing their idea of shield use on Lord of the Rings (or whatever). Thirdly, shields and bucklers were used very differently. A buckler covers one opening (high inside, low outside etc.) while a shield covers two (all the high line, all the outside line etc). With shields, the shield was the primary parrying tool, whereas with bucklers, the sword was. Buckler use is very much more complicated than shield use. Shield use boils down to two basic rules, 1)It's not a wall to hide behind, it's a ten pound knuckleduster and 2)move the body around the shield, not the shield around the body. If you want to learn more about historically documented shield use, I've written a bunch of stuff on the subject. Having said that, I've done almost no work LH vs RH. The assymetry is so weird that most left handers prefer to learn right handed. The few shield bouts I've had against left handers show me that people who've trained in a re-enactment environment will try to manoeuvre around the sword side and are just as vulnerable as RHers against the standard historical shield defence of slope stepping left while rotating the shield. Moving the shield to meet the attack is ingrained in our psyche. They just didn't do it. For most people, seeing the body move around the shield rather than v.v. is a major paradigm shift and it completely throws them when they first see it. I've done a little I.33 sword and buckler LH vs RH and by and large you just use the obsessio (counterwards) against the equivalent ward on the other side of the body, so if a LH forms underarm, you should take the Rare and Special Counter, while if they form Fifth Ward (the tail ward) you should take Half Shield or the Crutch. From there everything is mostly the same as fighting a RHer. In other words I haven't done my homework yet and before I can really understand how LH vs RH would differ I would have to understand how the normal RH vs RH is done. I did assume that there would be some carry over from RH, and LH techniques would have to work using similar principles. Quote: " move the body around the shield, not the shield around the body. " I do find this intriguing and I guess I would just have to see it done to understand exactly what you mean: I'm afraid that in any attempt to visualize this I might delude myself that I got it right. Oh, I do have your book " Medieval Sword and Shield " but I must plead guilty to having only read it quickly just to get an idea of the content. To do it justice it would take serious study ! In any case I hope that those who do have the knowledge to appreciate fully your input will learn something useful. 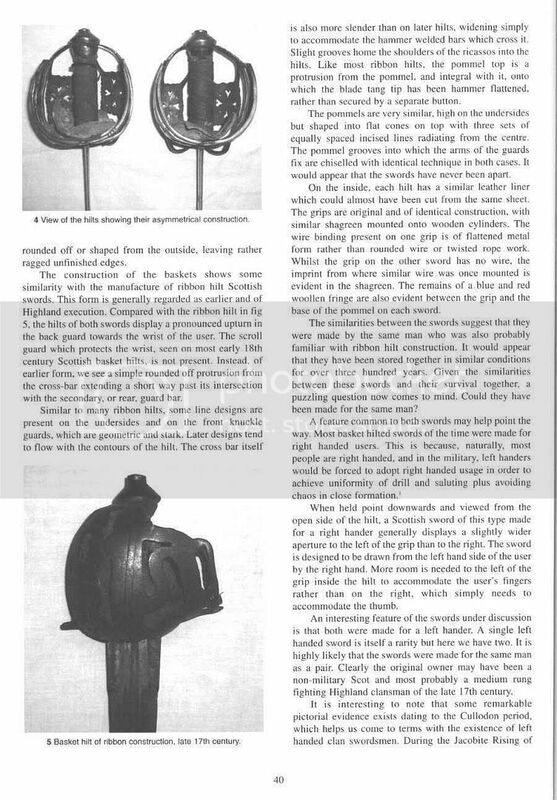 Medieval Sword and Shield is a book about the I.33 system of sword and buckler. We used the word shield because a buckler is a type of shield, shield is a far more widely used and understood name than buckler and we've learned not to be too esoteric in the names of our books if we actually want to sell any (please note that no one is ever going to get rich writing books like this - I reckon that my return on Medieval Sword and Shield so far has been about $1/hour). Large shields are used differently to bucklers. For an analysis of how they are used (based on snippets from a range of 15th and 16th century treatises, which conform to the positions shown in medieval and even ancient artwork) look at my paper in Spada: An Anthology of Swordsmanship published by Chivalry Bookshelf. Spada II, a new anthology of papers went to the printers about two weeks ago and contains a second paper on the evidence for how large shields were used, as well as a paper expanding and correcting parts of Medieval Sword and Shield (we said in the book that any of this stuff was a work in progress). So there's a goodly amount of sword and shield material out there. It's a tough system to find much on, but thankfully every single thing that I've found has shown that there were a few basic principles to sword (or spear) and large shield combat that appear to have formed the basis of combat from ancient times to the last use of the shield as a combat weapon. I shall have to do some more classes on this system. I did one in 2001 in San Francisco, and a couple of shield seminars here in Australia, but while shields are popular with re-enactors they aren't very popular with historical swordsmanship enthusiasts and large shields are hard to transport. Of all the historical combat systems I've looked at, sword and large shield is by far the most effective in comparison with the made up systems used by re-enactors etc. The concept of moving the body around the shield is so counterintuitive and so hellishly effective that it almost seems unfair to use it against people who haven't seen it...almost. Stephen - Thanks for bringing good points and discussion into this thread. It is true - the concept of moving the shield to block instead of moving behind is quite an uncommonly applied one. It works wonderfully well, as you have stated, for the larger, heavier shields. The focus for some of us is more on collecting. For others, there's a desire to understand how these items were used. If that desire gets strong, I can't begin to express how interesting and eye-opening it is to actually go and do, especially with the guidance of someone who has developed a level of skill. If unable to locate such a resource, careful study with some of the books (Stephen's work is good, guys!) will help a ton. Here's an article by Tony Willis ,from 'The Spring 2004 London Park Lane Arms Fair' catalogue (copyright D.A. 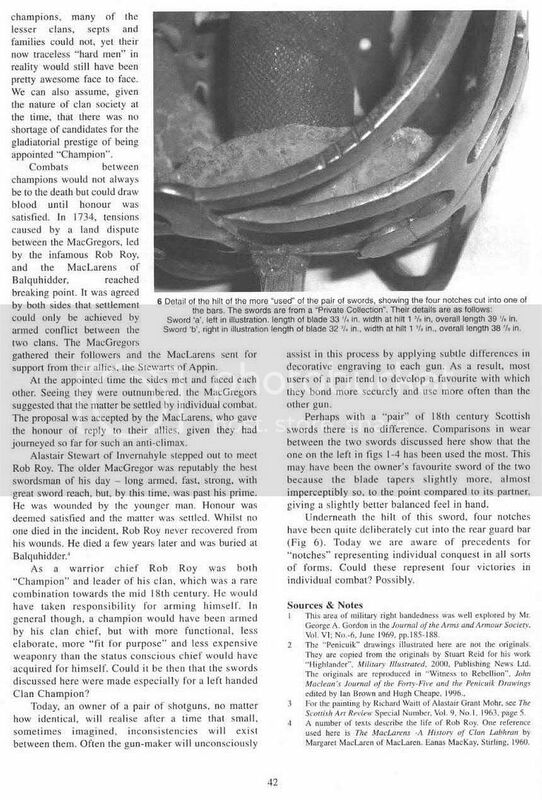 Oliver) that discusses a rare "pair" of left-handed Scottish baskethilts, with some history about the 'Southpaw' aspect ! Thanks again, I did notice in your first post that buckler use is very different and more complex than shield use. I did open your book at 5:00 a.m. and re-skimmed it in a sort of bleary eyed fashion: It is something that needs a lot of concentration and careful reading to be able to get the most out of it: Without a background in fencing it's a bit like diving into algebra without first understanding basic math. The thing is first to learn and commit to memory the vocabulary of the basics so that one can actually follow the meaning of the text and then to try to understand and visualize one technique before expecting to absorb the rest: If one can grasp the basic principles common to each technique the one can concentrate on the specifics of each. That said, at each read I do seem to be getting more out of it. Oh, and I will look into buying that anthology you mentioned from Chivalry Bookshelf: I'm really excited about it and I look forward to it. Like Aaron mentioned a lot of us are mostly collectors and more " readers " than " doers " when it come to the actual use. Will have a look at those articles, also thanks. Take that book in segments. It's exactly like algebra without the fundamental skills just reading it. Nothing sinks in. Go do, piece by piece. If nobody is interested in joining you, go shadow box. Work through the movements as best you can. Your understanding will increase tremendously, even if technique isn't mastered. You'll have an even deeper appreciation and affinity for your collection, too... and it's a blast. Tons of fun. The neighbors do look at you funny, though.